Whether you're in the market for a single window covering or coverings for your entire home, you can count on Jan's Custom Window Fashions to help you create a beautiful home. We're a Certified Hunter Douglas dealer located in Clio, MI, but happily serve our neighbors all throughout Mid Michigan, as well as Genesee and Oakland Counties and the surrounding areas. With Jan's, in-depth design consultation and at-home shopping services come standard alongside the wide selection of quality Hunter Douglas products we carry. 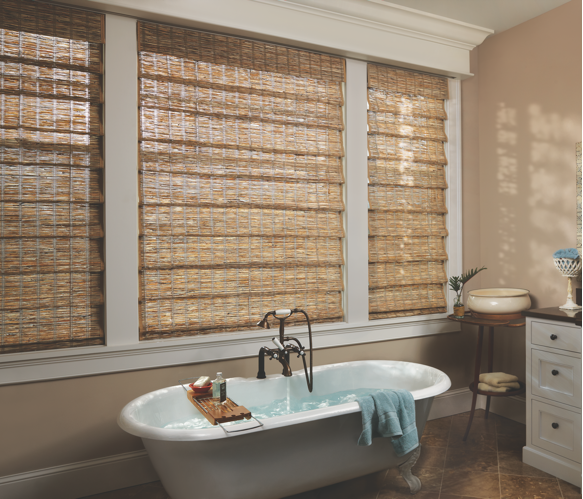 Explore more photos and descriptions of Hunter Douglas' blind, shutter, and shade products. Jan's Custom Window Fashions is proud to be your local Hunter Douglas Dealer and Hunter Douglas Certified Installer. 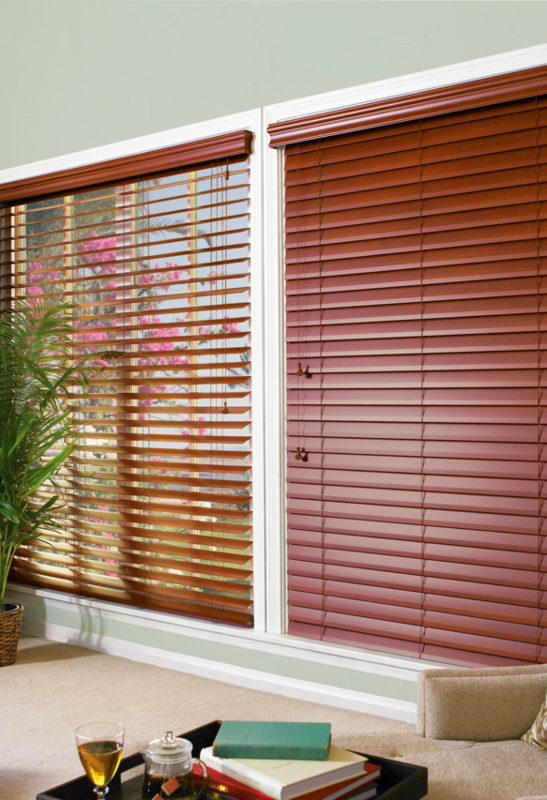 Our experienced team consists of Hunter Douglas window covering professionals who are trained to install blinds, shades, shutters, woven woods, sheers & shadings, and motorized products for proper fit and function. At Jan's we fully stand behind our products and services! The Hunter Douglas PowerView® Motorization is a revolutionary solution for your windows where you're in control of your home's ambiance at the touch of a button. 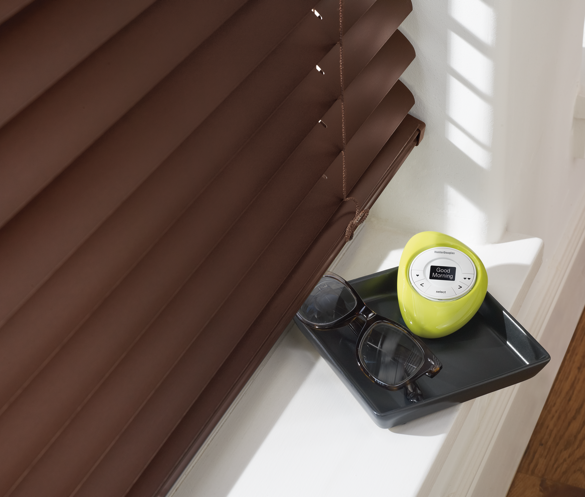 Let your motorized shades adjust themselves automatically to the perfect level on your schedule according to your preference. Create scenes and personalize your experience through the Pebble Remote, Scene controller, or PowerView® app on your smartphone or tablet. This system is also compatible with other home automation technologies for seamless integration. 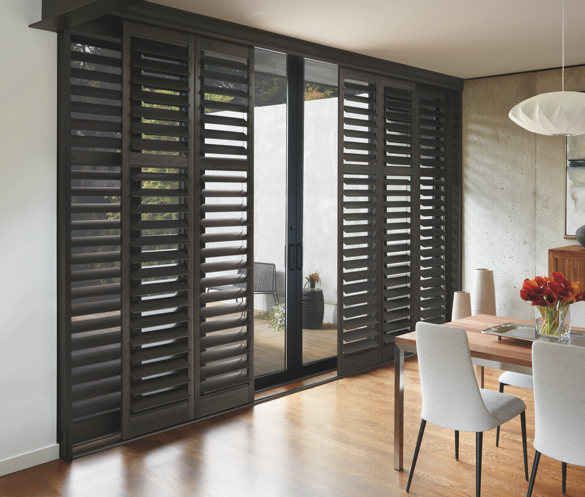 For a more classic look and durable window covering solution, Hunter Douglas offers three plantation-style shutter collections to suit your home. Every Hunter Douglas shutter product is built to last with exceptional craftsmanship and modern materials to withstand heat and moisture. Our Hunter Douglas Certified installers will ensure a proper fit for any size, shape, or height of window. Hunter Douglas offers vertical blinds, for wide window expanses and sliding glass doors, and well a comprehensive selection of horizontal or Venetian blinds. You'll find a wide variety of slat sizes, colors, and materials to select from, so you can achieve the exact look you want. 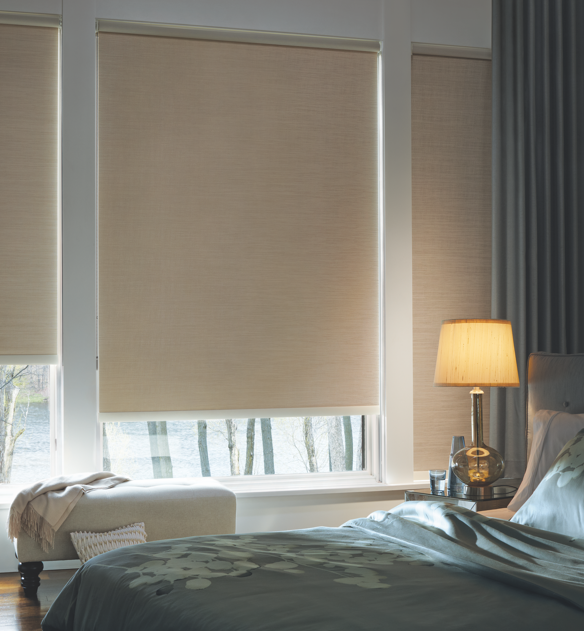 No matter the blind you choose, you can be sure of smooth and quiet performance, long-lasting quality, and beautiful home enhancing looks. With hundreds of luxurious fabrics, textures, colors, and looks to choose from, Hunter Douglas has a tailored, modern shade solution to fit your exact décor style. The team of experienced consultants at Jan's will work with you to recommend the ideal Hunter Douglas products, including cellular shades, honeycomb shades, Roman shades, of roller shades, based on your privacy, light-filtering, and energy efficiency needs. Hunter Douglas' unique families of window coverings called Woven Woods and Sheers & Shadings offer a distinct look you won't find anywhere else. Achieve a contemporary, warm, and natural look that transforms sunlight with a blend of light-filtering reeds, grasses, and woods with the Woven Woods collection, or a beautiful, diffused natural light effect with infinite degrees of light control with the Sheers & Shadings collection. Copyright © 2018 Jan’s Custom Window Fashions. All Rights Reserved.